Bode Miller photo courtesy of USSA. The 2015 World Alpine Ski Championships are just two weeks away, and American ski-racing fans just got one more big reason to book a trip to Vail and Beaver Creek next month. Arguably the greatest American male ski racer of all-time, New Hampshire’s Bode Miller, is recovered enough from back surgery that he finished 27th in a training run for the legendary Lauberhorn downhill at Wengen, Switzerland, Tuesday. 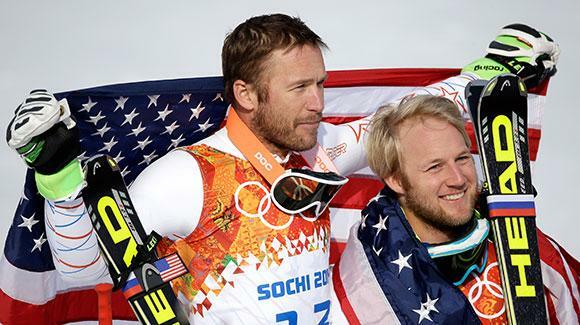 Bode Miller, left, and Andrew Weibrecht celebrate their bronze and silver super-G medals at the 2014 Winter Olympics (USSA photo). 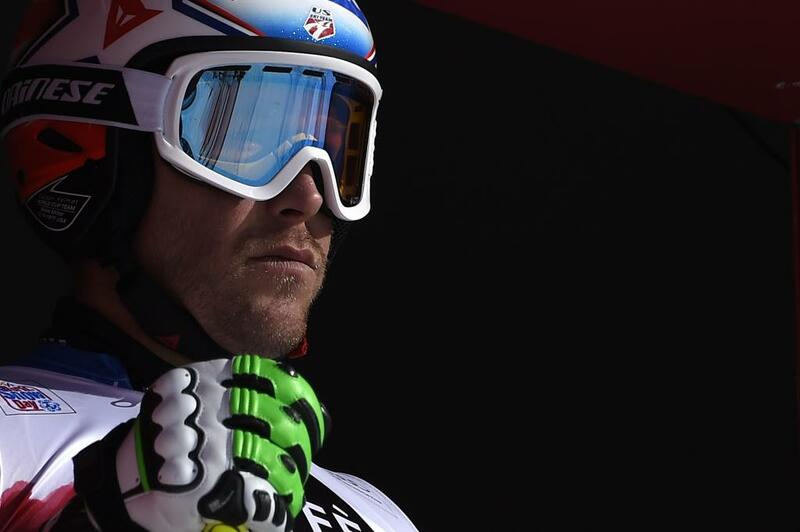 Miller did not race in Wengen but was a forerunner and skied with a special POV camera for training purposes. The fact that he’s skiing increases the chances the two-time overall World Cup champion and six-time Olympic medalist will race for the first time this season in Kitzbuhel this weekend and also that he’s compete in Beaver Creek at the World Championships Feb. 2-15. A four-time World Championships gold medalist, Miller also has won four times in Beaver Creek on the regular World Cup tour. Having the 37-year-old in Beaver Creek will make the races so much more interesting, although his ability to win here will largely depend on how quickly he can regain his physical conditioning. “It felt bad but that’s what I was expecting as this is a tough race to come to as your first race of the season,” Miller told the International Ski Federation Tuesday after his run at Wengen, where he’s won twice before. The World Championships men’s downhill is scheduled for Saturday, Feb. 7 on the Birds of Prey course at Beaver Creek. Miller has won the downhill here three times – most recently in December of 2011. The 33-time winner on the World Cup circuit (the most ever among American men) also has won a giant slalom here (way back in 2005), and was second in a GS to Park City’s Ted Ligety as recently as December of 2013. The World Championships men’s GS – an event Ligety has won five straight times at Beaver Creek — is scheduled for Friday, Feb. 13. The 24-time World Cup winner and double Olympic gold medalist will be a heavy favorite to claim his fifth World Championships gold medal. Local racing legends Lindsey Vonn and Mikaela Shiffrin also will be among the favorites to add to their World Championships medal totals. Vonn, who broke the women’s all-time World Cup record in Cortina, Italy, on Monday, will be favored in the women’s super-G and the women’s downhill on the Raptor racecourse at Beaver Creek on Feb. 3 and Feb. 7 respectively. Shiffrin will be a heavy favorite to defend her 2013 World Championships slalom gold on Feb. 14 at Beaver Creek, and could also medal in the GS on Feb. 12. She won the opening GS on the World Cup circuit this season. She also had won two straight slalom races before finishing third in a night slalom in Flachau, Austria, last week — the final women’s tech event before Worlds. All of the Beaver Creek races are free and open to the public. Go the the World Championships website for more information.